A former British Prime Minister, Tony Blair, has confirmed that he held a private meeting with the candidate of the All Progressives Congress, Muhammadu Buhari, in London on Saturday. 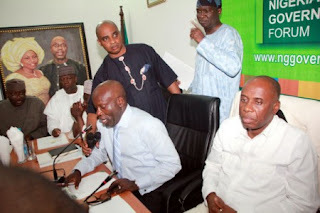 There has been speculations in Nigeria that a picture showing Messrs. Blair, Buhari and Governor Amosun as well as a former Kwara state governor, Bukola Saraki, was photoshopped. 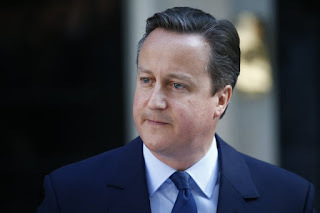 Mr. Buhari’s campaign office had stated that the former head of state was in the U.K. on a working visit. However, Governor Ayo Fayose of Ekiti state and supporters of the ruling Peoples Democratic Party, are claiming that Mr. Buhari is in the UK for medical treatment. 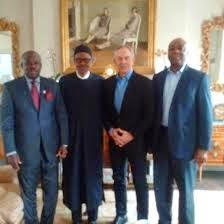 To buttress their claim, some of the critics claimed Mr. Blair was not in the U.K. on Saturday and could therefore not have met Mr. Buhari. Premium Times contacted the office of Mr. Blair for confirmation and got a response that the meeting actually held. “Mr. Blair had a private meeting with General Muhammadu Buhari in London,” said Rianne Buter in an email response to Premium Times’ inquiry. Ms. Buter also said Mr. Blair “hopes to visit Nigeria shortly when he will see the President”. Chatham House has now confirmed that Mr. Buhari will speak Thursday on the topic: “Prospects for Democratic Consolidation in Africa: Nigeria’s Transition”. Details of the event as posted on the website of Chatham House also revealed that Mr. Buhari would speak for one hour between 10 and 11a.m. and the event would be chaired by Richard Gozney, the British High Commissioner to Nigeria between 2004 and 2007. Chatham House encourages interested persons to send questions to Mr. Buhari via Twitter.